Q1 has been pretty poor for me - up 1.3% vs. 9% for the FTSE All-Share. My general policy of not running a stop loss has hurt me. A further aspiration over the next few months is to get positioned for the next big thing - whether that's Africa, crypto, or life extension. Quick Portfolio Review - Q1 has been pretty poor for me - up 1.3% vs. 9% for the FTSE All-Share. This is despite being up at various points. My general policy of not running a stop loss has hurt me. It might be time to consider putting stop losses on my more liquid holdings. This is very much a function of where we are in the cycle - likely near the top/end - and not a general policy. While some people would say that not having stop losses is reckless, I would disagree. My psychology is such that it is actually quite easy for me to admit/think I am wrong and get out. I don't feel any particular psychological pain in doing this, unlike most. I feel far more pain holding all the way down, but often, particularly in the more illiquid positions I hold, this is the correct thing to do. My positions are generally thoroughly researched/thought through, and I shouldn't change my mind until the facts change, price is often largely irrelevant. This isn't to say the general reader should run without a stop loss. Most investors tend to be optimistic, thinking holdings will come back regardless of news. I tend not to think like that. I have to force myself not to sell, even when things are down a negligible amount. I still have c. 30% in cash/gold and silver. This is likely to be a drag on performance unless gold/silver go on a run. I am not too worried. I hold this to preserve wealth and diversify away from holding Global Petroleum (OTC:GBPOF). I also include in this my holding in Tau Capital (OTC:TAUPF) - which is giving me back roughly half what I paid for it, but also a position in a new venture of which I know little. I also include PV Crystalox (OTC:PVCRF) in this (discussed below). The next position is AssetCo (14.4% weight). This is one I have quietly watched for years. It's an Abu Dhabi fire brigade training outfit with a market cap at offer of £42.7m and a book value of £29.9m (lots of cash/receivables), along with a marginally profitable operating business. Where it gets interesting is it has been awarded £33.4m worth of damages from an accounting fraud paid into court by Grant Thornton. I bought on the initial judgement, but then bought a touch more than I otherwise would/should after misreading the RNS. I thought the judgement couldn't be appealed, but it could. This, of course, could take years (the judgement accrues at 7%). It has already been to the high court. However, I analysed all appeals from high court judgements over the last couple of years. It seems (roughly) 2/3rds don't get permission to appeal, and even the third which is appealed, they usually don't get very far. They aren't often wholly overturned. I also read the whole judgement - which to me, as a non-lawyer, seems sound. So I think the market's valuation of the judgement is a little harsh and it should only (say) be discounted by 25% at most, giving a fair market cap of £54m or north of £4.40 per share. The company is dominated by Harwood Capital (48%) Lombard Odier (27.6%) and Ingot Capital (19.7) - so I am pretty confident of getting my money back when this is resolved. As you might imagine, this is very illiquid so not one for people with serious amounts of money. I didn't post at the time as I wanted to quietly buy more and then the price was too high to be interesting. Next biggest holding is Foundul Proprietatea, which I like and have held for years. Alternative Liquidity Fund (ALF) - 6.3% - Again, I bought this back in 2016. I must have already doubled or tripled on it, at least. It is still trading at half NAV - confident there is more money to come. Much depends on if Brazil pays its Electrobas debts. I think it will and the discount they have put on the fund is unwarranted. This shouldn't be looked at that way - it will either pay, or not. Gielda Papierow Wartosciowych w Wrszw SA (GPW) - 4.2% - Not much has happened since I wrote. Just Group (4.1%) - This has been a bit of a disaster, falling over 30%. I think due to a surprise equity placing along with convertible debt. I thought this was in the price, but got it very wrong. I bought a bit more at 60p. Not tempted to sell at this low a fraction of book. Pharmanutra (PHN) (OTC:PMMHF) (3.7%) - Announced that it is issuing shares in exchange for property from the government - could be a positive - depends on the price of the shares - which has not been announced. Donaldson Co. (NYSE:DCI) (3.7%) - Announced results which were not good, but which were as expected. You still get €170m of equity for €56m worth of market cap. Assets are being sold, not at great prices, but they are being sold, so I remain reasonably positive on this. Manolete Partners (MANO)/Litigation Capital (LIT) - 2.6% and 1.9%, respectively. These have done very well - particularly as MANO started as a smaller position then grew. I haven't posted on them - their story is quite well known in the UK and they rapidly went up after I bought. They are litigation funders. MANO is particularly interesting as it buys insolvency litigation cases from the litigators. It is expanding reasonably aggressively. If you believe (as I do) that recession is likely, particularly in the UK, this isn't a bad sector to be in. Shares in MANO have more than doubled since I got in, so not sure I would add here. I intend to hold both. PV Crystalox - Although I said I sold out of this, I bought back in again. It might be worth slightly more than 25p. This should possibly be counted as cash. Walker Crips (WCW) (2.1%) - Has done very badly, it is still very cheap. You get 9.8m of NTAV for a market cap of 11.1m. Problem is they are marginally profitable and seemingly going nowhere. I should have waited before getting in, but I am prepared to wait to get out - unless things really take a turn for the worse. 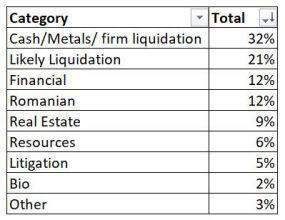 Dragon-Ukrainian Properties (DUPD) - 1.87% very similar to DCI - property fund liquidating. It has cash of $5m, NAV of $33.7m, little debt and a market cap of $14.9m. They do have a controlling shareholder - something that I don't like, but they also have another large shareholder who I hope will stop them delisting. The controlling shareholder has offered tenders to the minorities in the past - I am confident they will in the future. RiverFort Global (RGO) - 1.8% - relatively new to market - investing in equity linked debt. So when your neighbourhood AIM mining share issues convertible debt, they get the return on the debt and also warrants/royalties/conversion streams - which are not on RGO's balance sheet. If the miner does well, they can prosper via equity, and if not, they get nice secure debt. They were at a slight discount to NAV last time I looked. I will review this in a year or two and see how they have done. 4D Pharma (DDDD) 1.5% - Lost quite heavily on this since entry. Yet, management keeps buying, they were published in Nature Publishing Group journal Scientific Reports, and I am confident it will work out. To look to see what can happen take a look at RENE's chart. Royal Mail (OTCPK:ROYMF) (OTCPK:ROYMY) - 1.4% - I bought a little of this a while back. If you think about it, what is the logical/cheapest way to deliver 95% of packages? One delivery per day. RMG still have a massive scale advantage, a degree of monopoly and is actually pretty good. At some point, I think it will be either taken over or regain dominance - it will probably be taken over. I am not concerned with the unions as they simply don't have the will to fight. It is more likely that a future Corbyn government might buy it back. CMC Markets (OTC:CCMMF) - 1.1% - Hasn't done well. Trimmed quite a bit. I am a little concerned its business model is challenged and the worst is yet to come. But it is very, very cheap, though could be a classic value trap. Still, there is potential for this to very rapidly turn around so I am holding for the time being. I will buy again on further major weakness. Miners - I have put a bit into a few miners. The sector is quite cheap. There is opportunity there, but it is new to me, so weights are very, very small. Fox Marble (FOX) - 1.3% was 1.3% - I am rapidly loosing patience on this. Sales have been too slow to materialize. I still hold, but I am not sure how much longer for. One more year then I will likely call it a day. Shanta Gold (OTC:SAAGF) - 1.9% done well - Cut my position a touch on strength. Not sure of their plan to list singida in Tanzania. I maintain my view that catalysts seem likely. Speculative/learning positions - I have put tiny, tiny amounts in Savannah Resources (SAV) and Hurricane Energy (HUR) (OTCPK:HRCXF) simply as they seem good ideas - particularly HUR. But I don't have enough experience/knowledge to invest well in miners/oil exploration - so I need to focus the mind a bit by putting a bit of spare change - which will make me pay attention. SAV (0.3%) - European Lithium producer, amongst others. I have a very, very small position to try and learn about how these things go. HUR - 0.3% - Now this is interesting, but very, very risky. It's the project of a guy who believes you can frack under the North Sea. It's never been done before, but he thinks it can be and I believe him. The opportunity is large - 2.3bn barrels of oil for £900m market cap. Having said that, my weight is tiny, even if it ten bags, it will make no difference to performance. Looking at it like this, it is reasonably balanced. I think I could do with a bit more bio/health related stocks, and as ever I like a nice liquidation play. I really don't want any more little positions. I want to have the conviction to put in 4/5%+ (though possibly not for bios). I would also like to buy things other people want to buy before they do. I have done a bit of that with the litigation funders. One of the ironies of the last few months is the risky stuff - Polish, Shanta, Romanian - have done well, but the safer financials - JUST/CMCX - have hurt performance, netting off overall. A further aspiration over the next few months is to get positioned for the next big thing - whether that's Africa, crypto, or life extension (as Jim Mellon was suggesting at master investor). Any ideas where that is?